Update: In May, the Fairfax Co. commonwealth's attorney said there would be no charges filed against the officer. Fairfax County police have identified the man killed by an officer after he allegedly shot two men and kept a hostage barricaded inside a burning home. Two brothers called 911 about 2:40 p.m. Monday and said they had been shot at a home in Herndon and were driving themselves to a hospital, Fairfax County police Chief Col. Edwin C. Roessler Jr. said. Officers arriving at the townhouse on the 13300 block of Covered Wagon Lane heard gunshots inside and saw smoke coming from its third floor, the chief said at a news conference. 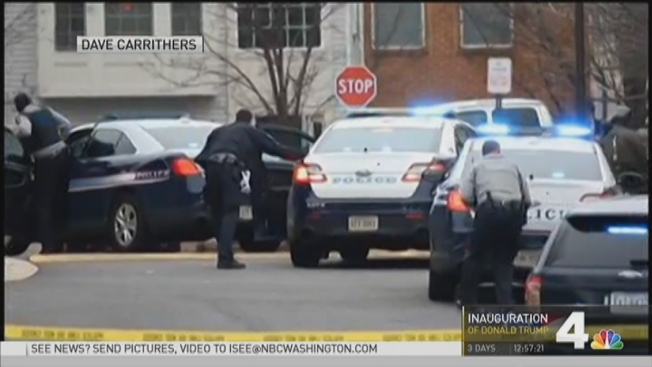 Police shot and killed a man after they say he shot two brothers and then started a fire inside a townhouse in Herndon, Virginia, while holding a hostage in the house. News4's Darcy Spencer is live on the scene. Roessler said a man saying he was being held hostage called 911 to report that he couldn't breathe, but firefighters weren't able to enter the house because someone kept shooting a gun inside. Police negotiators were talking to the 32-year-old Mohammad Azim Doudzai by phone, but the chief said he refused to cooperate with them. "The fire meanwhile is growing more intense, but keep in mind that the fire department cannot make entry when there is someone inside shooting, and now there have been multiple gunshots from inside this house," police spokeswoman Julie Parker said on the scene Monday evening. 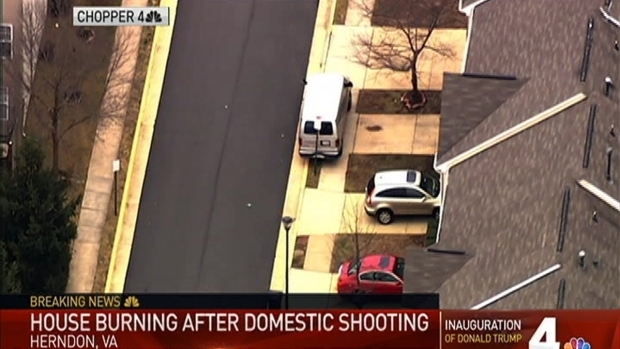 Two people were found with gunshot wounds inside a home in Herndon, Virginia, where there also was a fire. 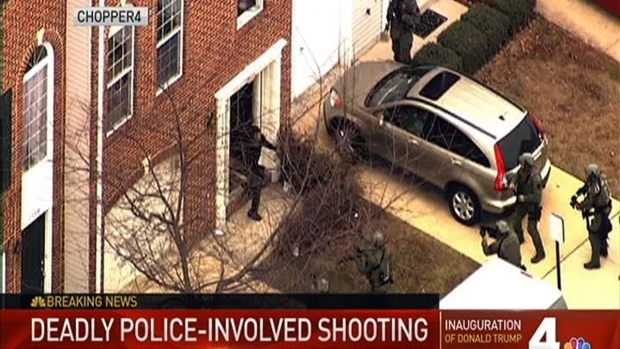 Video shot from Chopper4 appeared to show police throw a flash grenade into the home. The devices are used to stun the targets. Doudzai opened the front door and was holding what appeared to be a knife, Roessler said. That's when an officer shot Doudzai, who died at a hospital. Officers then were able to help the man who was being held hostage. The man held hostage amid the blaze suffered from smoke inhalation. The two brothers who were shot took themselves to a hospital before police arrived. They had life-threatening injuries. All victims and witnesses were being interviewed Monday night, Roessler said. Police have not released information about the relationship of the people involved.